This new catamaran is the perfect compromise between the iconic 450 and the 52. She offers an attractive option to navigators in search of a large, seaworthy and modern owner’s boat. With her new visual identity, rigging and hull design, she provides increased performance and easier than ever handling. 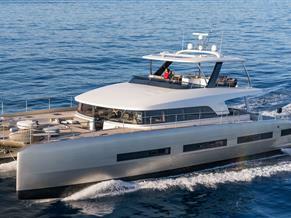 The elegance of the 50 is enhanced by the bevelled shape of her hulls and new window profile. The volumes and panoramic views, are more than ever optimised. New features will include an optional tender/bathing platform and lowering forward saloon windows. With unparalleled accommodation possibilities, this new model is available in three, four or even six cabins. The 50 is a brand new design in all respects and sits elegently perfectly between the 45' and 52' models, both in terms of size and price. The steering wheel is centrally positioned, with a navigation pod angled to face the helm. The helm seating area, and the sundeck behind, are designed with sociability in mind. When not in use, the flybridge sunbathing cushions can be neatly stowed in their dedicated locker: problem solved. The mainsail is a tall, high aspect ratio design, raised on a centrally positioned mast. This provides the multiple benefits of sail shape efficiency, reduced pitching, a self-tacking headsail and a short, easy reefing boom. A first for Lagoon, manouevring is eased further by a Harken line feeder (optional) to operate the traveller system. The forward cockpit is a U-shaped design with the windlass box in the middle which also serves a small table. A solid gangway, suspended above the trampoline, extends to the bow rollwer on the cross beam where the anchor is housed. Elegant, roomy and practical, the aft cockpit incorporates a huge L-shaped dining area, a lazyboy opposite and bench seating on the aft beam, which also incorporates the liferaft stowage. There is also room for a Corian topped wet bar with optional sink and icemaker below. Access from the stern is very simple from behind or from the side, thanks to an extended transom and only two further steps up to the cokpit floor. The yacht comes with the option of a dinghy hoist system or a folding Tenderlift system which doubles as a wondeful stern bathing platform. The interior of the 50 represents a huge leap forward in design. The front end of the saloon is raised, to afford a wonderful panoramic view from the huge U-shaped seating area. The optional multiway table can be raised, lowered, or extended or stowed out of the way to suit your social plans. Raising the saloon floor in this way provides additional space on the inboard side of the corridors, into which can be fitted a dressing room, a double cabin or simply extended storage. As a result, the layout options have been multiplied to suit more or less any possibility. Fitted out in the new Lagoon standard walnut colour woodwork, and with clever concealed lighting, the 50 feels particularly restful and luxurious. Looking for a new private yacht, yacht management or the best charter management program? Together with our partner Yacht-Match we offer ownership solutions, yacht management or charter management around the world. Yacht-Match forms an exclusive partner network with a worldwide selected group of highly service orientated companies and offers tailor-made charter management with yachts from all the renowned shipyards in Europe, for production build yachts and semi-custom build yachts. Based on what you are interested and knowing your preference, you can count on us to inform and guide you in the best possible way. We steer your purchase course around tax issues and legal cliffs, towards the matching yacht, area and operator. Just contact us for a customised estimate.